For one day in London every June and December, the Russian assets which regularly pass through greased palms on terms dismal for their repetitiveness, are of a beauty to make you forget the damage the trade does to the country and its people. The Russian Art Week auctions are the occasion. The results are an indicator of the price the Russian market, and also the foreign one, place on this beauty. The auction houses claim not to know who buys and who sells. In fact, they keep the identities and addresses secret. That’s because the money for which the art works were exchanged may have been dishonestly come by at the start, hot in transit, and laundered now. For the last survey of the market after Russian Art Week in November-December 2016, click to open. For a comparison of this week’s results with those of June 2015, when the demand and price had collapsed, read this. Sotheby’s reports that its sale fetched £9.9 million. This compares with £10.9 million in June 2015; £13.8 million last December. The top-priced pictures at the Sotheby’s auction were both by Isaak Levitan, “Summer” (below, left) and “Overgrown Pond” (right), and both were sold at £908,750, fractionally below the minimum estimate of £1 million. Levitan painted them in 1881 and 1891, respectively. Compared to Sotheby’s and Christie’s, MacDougall’s remained in third place in the amount of money traded for paintings. However, with total auction proceeds this week of £4.5 million, the house beat its previous best — £2.7 million in June 2015; £3.7 million six months ago. 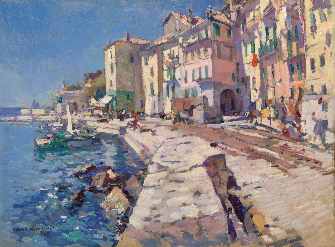 Konstantin Korovin’s painting, “Quai de l’Amiral Courbet, Villefranche-sur-Mer” (pictured below) set the highest price on the day. Painted in 1922, Korovin was in French exile by then. The work was sold by an unidentified owner who had bought it from Sotheby’s in 2002. The price of the new sale, £629,700, was 57% above the top estimate MacDougall’s had given before the auction. “I believe that this result demonstrates that the Russian art market is recovering rapidly. We see a great level of activity on the part of buyers, collectors and art dealers,” commented William MacDougall. Dmitri Stelletsky, “Fox Hunt” (1912) – sold for £257,000. Lot clearance is a measure of how well the auction house has calibrated its supply with the market demand; and also the price which works consigned for sale are likely to fetch in present market conditions. The value of the picture sales is a measure of what buyers, principally now Russian buyers, can afford; and also the price they believe will grow in future. This week’s buyers have shown they are willing to pay premiums for works which have Crimea in the title and show scenes of the Crimean coast, hinterland, or scenes of Crimean history. Sotheby’s sold several late-19th century canvasses by Ivan Aivazovsky. The one titled “Ship off the Crimean Coast” (lead image, left), painted in 1881, was sold for £87,500, 49% above the estimated top. Another Aivazovsky seascape, inscribed Odessa 1868, fetched £320,750; it had been estimated at a maximum of £180,000. A third Aivazovsky, titled “The Bay of Naples”, was sold for £52,500, at the bottom of its estimated range between £50,000 and £70,000. However, Aivazovsky’s “Greeting an American Ship” (lead image, right), estimated between £40,000 and £60,000, failed to sell at all. “I expect the ‘Crimean theme’ will be a red rag for a long period of time,” Lukashin observes. “The popularity of such works of art depends on the political views of the buyers. Nevertheless, the auction houses themselves are still trying to avoid the ‘Crimean theme’”. 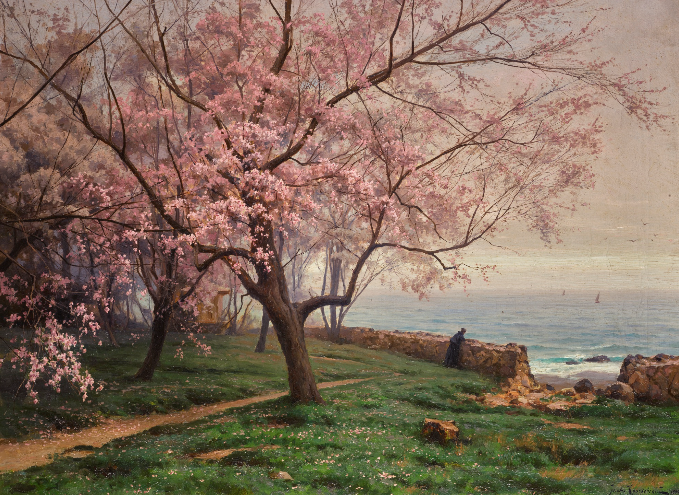 Iosif Krachkovsky, “Spring in Crimea”, 1904 – estimated by Sotheby’s to fetch between £30,000 and £50,000, it sold for £75,500. 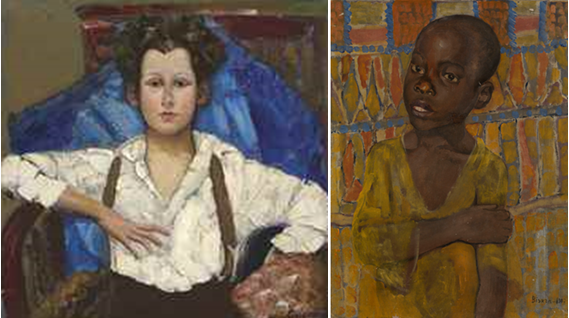 In the run-up to this week’s auctions, MacDougall’s promoted an early work by Kuzma Petrov-Vodkin, titled “Portrait of an African Boy” (below, right). According to the promotional materials, “he painted the masterpiece in 1907 during a two-month trip to Algeria and Tunisia.” The house set a reserve price range between £400,000 and £600,000 on the work. But there was no taker. Left: Boris Grigoriev, Portrait d’un jeune garcon, 1930s – sold by Christie at £257,000, almost double the reserve price and the second best-seller for the house. Right: “Portrait of an African Boy” by Kuzma Petrov-Vodkin.